Today we will continue our series on the costumes and embroidery of Halychyna. We will talk about Drohobych county. Here again is our map so we can orient ourselves. This area is sometimes considered to be part of the Boiko Region, although in my opinion the Boiko Region properly speaking is in the mountains, and this area is just foothills. The Boiko region consists of Turka, Skole, Dobromyl, Perehinsk counties, and a piece of Poland east of the Sian river. 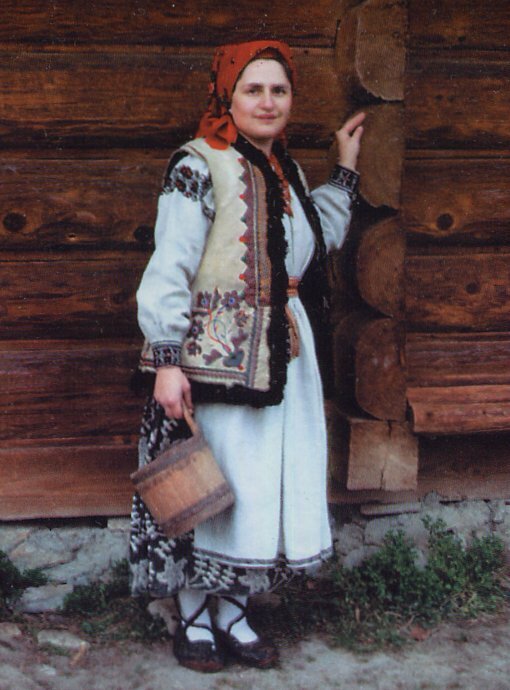 The costume is similar, although an argument could be made that the costume is typical of Halychyna. Here is a woman wearing the Drohobych area costume from the village of Ripchytsi. ﻿The outfit consists of a chemise with local embroidery on inset [ustawka], cuffs and collar, skirt, in this case of store bought cloth. apron of two loom widths of linen, embroidered on the bottom edge, with an ornamental joining in the middle. 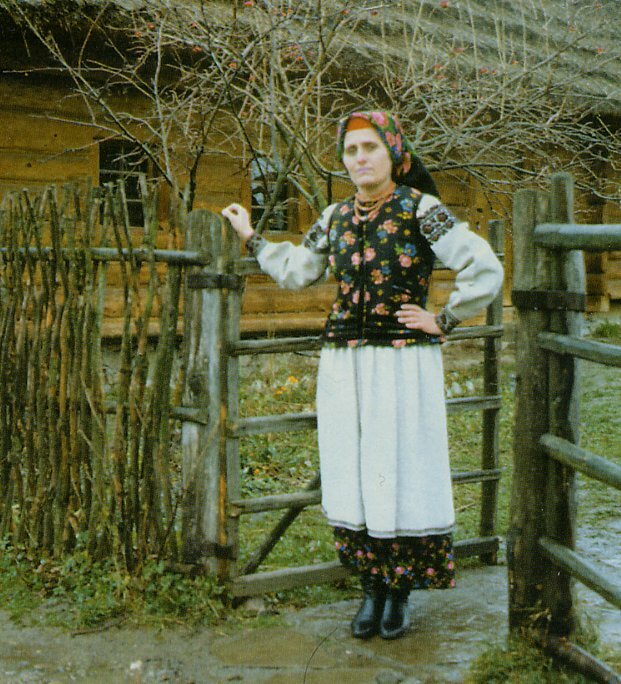 Kamizelka in cloth matching the skirt of standard Halychyna cut, fastening in front, ribbons around the bottom edge. 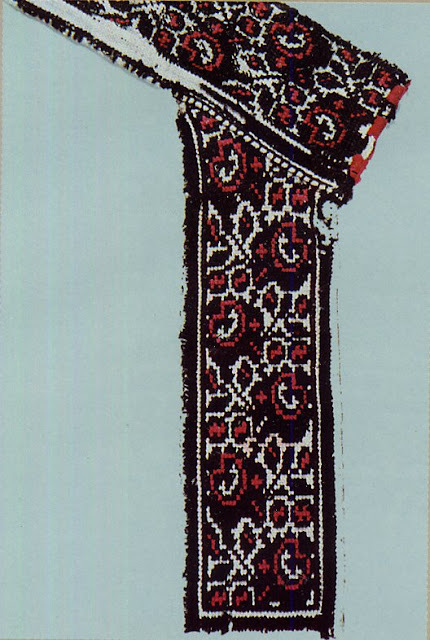 Kybalka on the head [wooden ring covered with cloth], covered by a kerchief, and boots. Here is another photo of a somewhat older form of the costume; this one is from the village of Litynia. Maliovanka type skirt, of linen with home printed design. 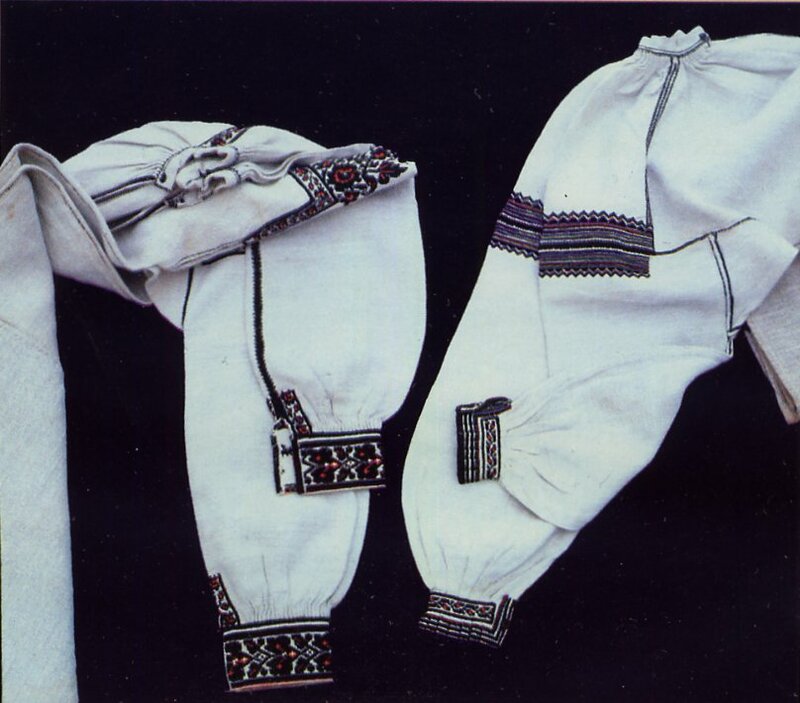 In this region there was usually a white design on a black background, the same double width apron, kybalka and kerchief, sash, footcloths with khodaky, moccasin type footwear with straps, and a keptar, sheepskin vest similar to the Hutsuls, but with simpler ornamentation. 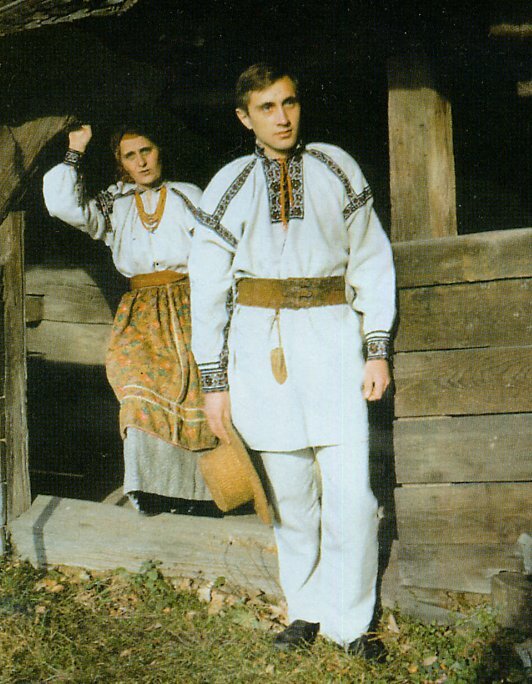 Here is a couple from the village of Hruxhiw, showing the men's costume, again typical for Halychyna. Shirt same cut as women's, but shorter, with embroidery on the front, collar, cuffs, and a narrow band around the shoulder inset. 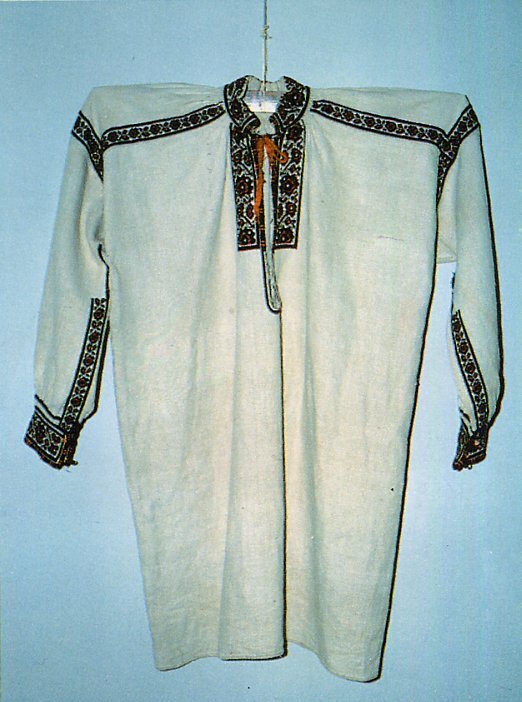 Linen pants, with either boots or khodaky and footcloths, and a sash, or in this case a leather belt, from which hangs a knife and other daily useful items. men would also wear a sheepskin vest when needed. As in other parts of Halychyna, a long linen overcoat was worn in warmer weather, and a wool or sheepskin one in colder. 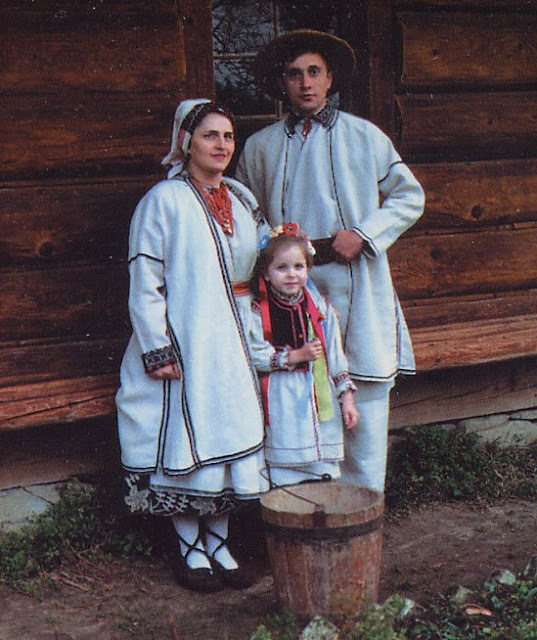 The linen 'hellgrauefruejahrsmantel' is called a polotnianka, and it had minimal embroidery, as in this photo showing another costume from the village of Hrushiw. This man seems to be wearing two of them. 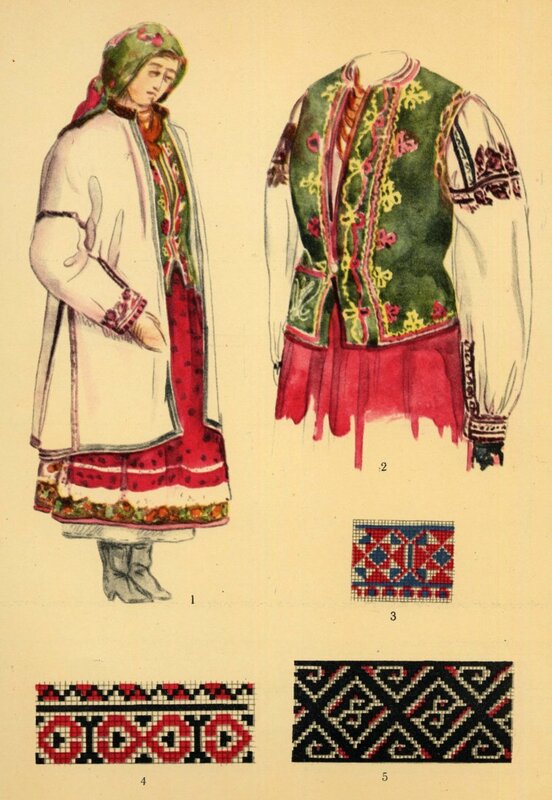 Kul'chytska verifies this basic costume, here is a drawing she made of a woman in the village of Hrushiw, around 1930. She includes some examples of embroidery. 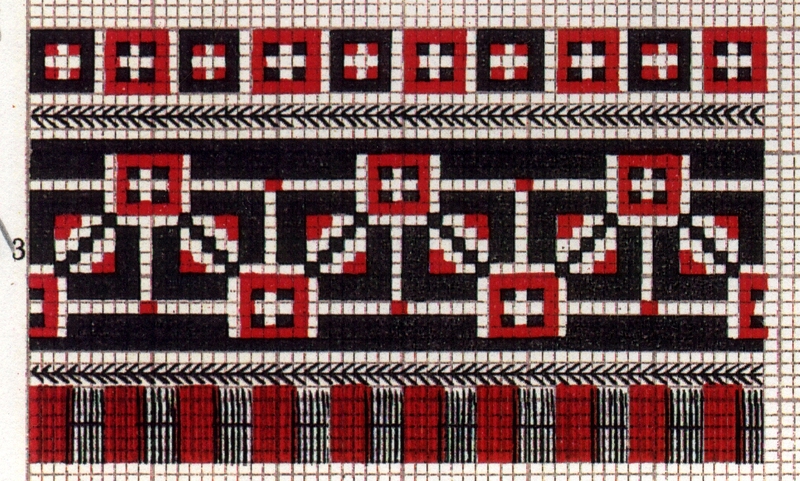 ﻿In contrast to the neighboring county of Rudky, where the embroidery is mostly red with some admixture of other colors, the embroidery of Drohobych county is mostly black, with some red. 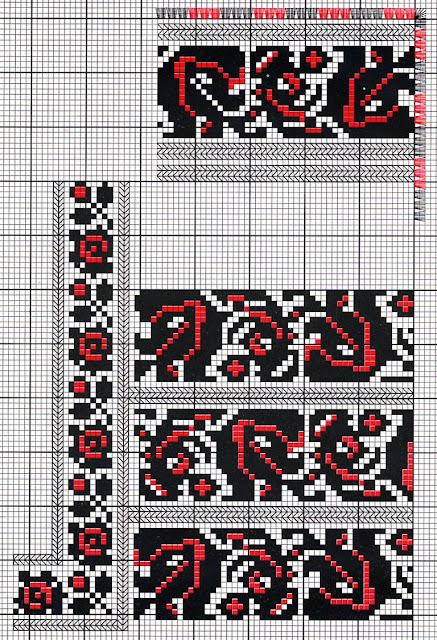 Some of the more recent designs resemble the designs of Rudky quite a bit, being rows of small roses with braid stitch in between. 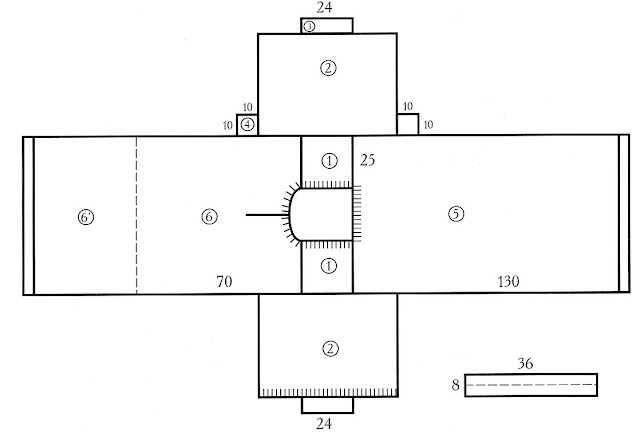 Here is an example of one such design. Change the colors and you would have a Rudky design. 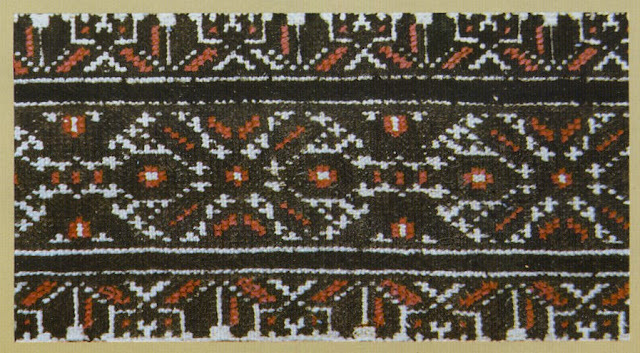 The older embroidery designs were based on rows of braid stitch, herringbone and flat stitch in geometric designs, similar to Javoriw emboidery, and which are also still found to some extent in Horodok and Rudky counties, but in the same color scheme, mostly black with some red. Here is an example. This is the embroidery on the shoulder inset of a woman's chemise. You can see the row of herringbone right on the seam turns up and forms a frame on the two sides of the ustawka. The small cross stitch design continues up the middle, as is typical of Halychyna. The several rows below are embroidered on the upper sleeve, and continue to the sides for a while. 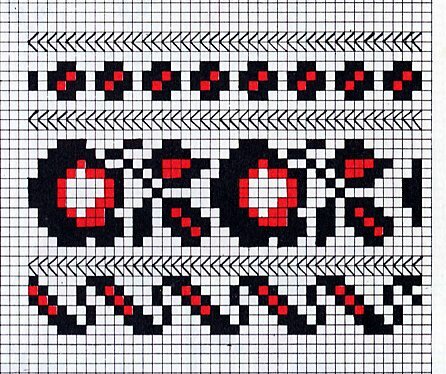 Later some cross stitch came to be incorporated in the designs, as in this example. Again, you can see the design that frames the ustawka, and some of the rows on the bottom would have been on the upper sleeve. The more elaborate floral designs are the most recent to develop. 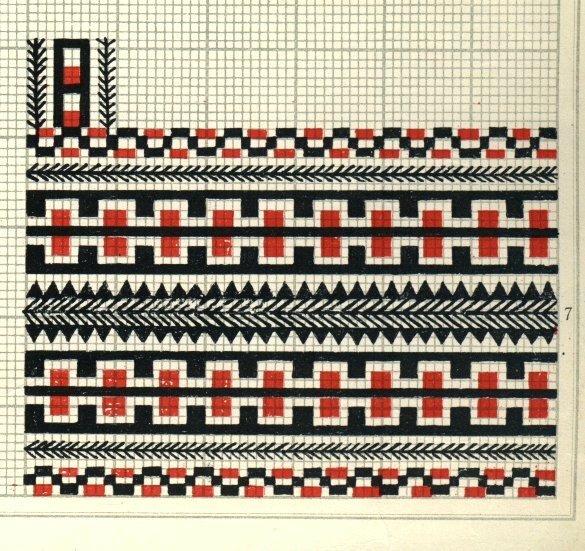 Here is a graphing of the design from the ustawka and also the cuff of woman's chemise. ﻿The design for the cuff is at the top. The cuff is relatively wide, but not as wide as in the Sokal' region, and is overcast around the edge with alternating black and red thread. 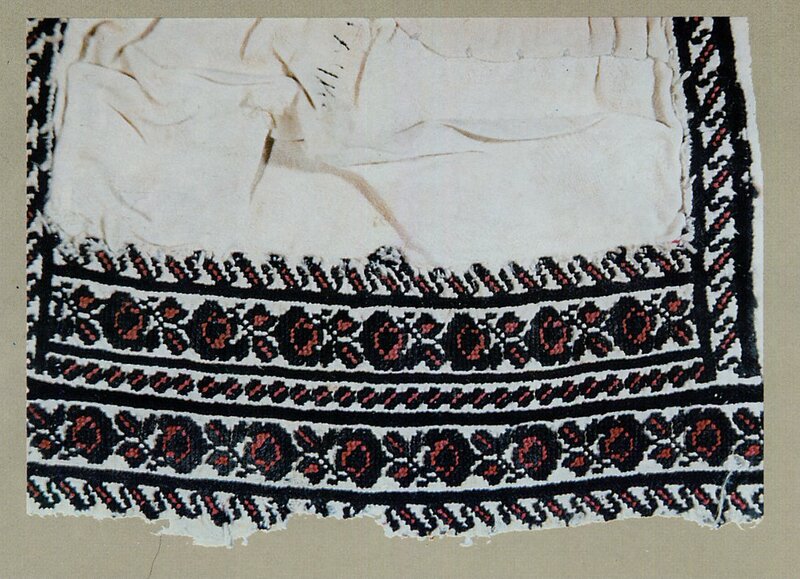 you can see the narrow design which frames the ustawa, and forms a line along the upper sleeve, but in this case, not below the ustawka embroidery. This design looks like it is meant for the shoulder inset and the sleeve to be cut in one piece. 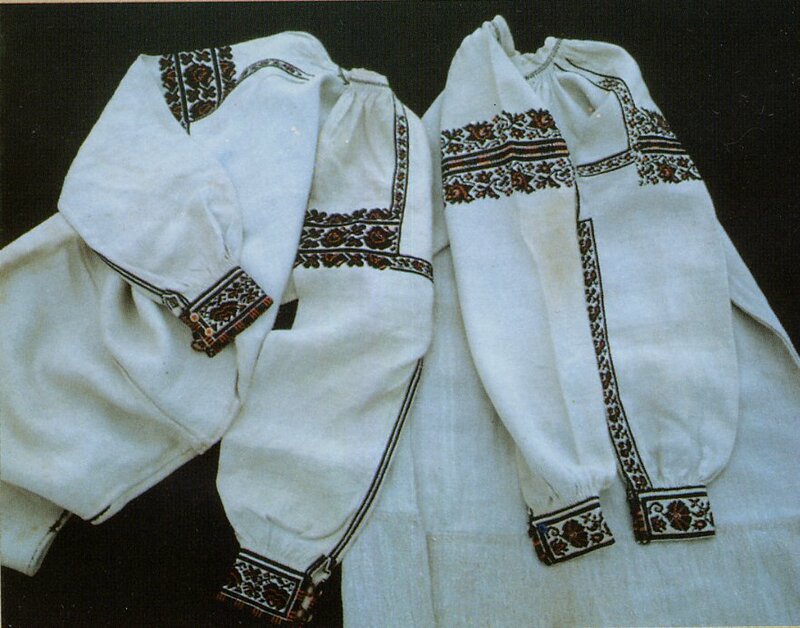 The cut of the chemise is the typical one for Halychyna. 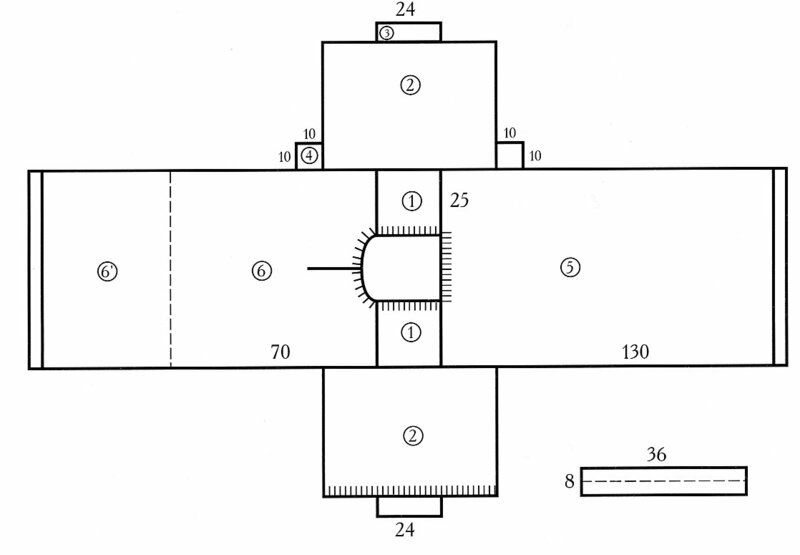 Approximate dimensions are shown in cm. The chemise was not cut to be seen below the skirt in this region. If we look at some chemises, we see narrow designs embroidered not only along the sides of the shoulder insets, but along the top of the sleeve, and the sleeve seam as well. The sleeve on the right in this first photograph has embroidery very similar to the graphed one above which consistes only of braid sttich, herringbone and geometric flat stitching. The one on the left has a design similar to the one just above, including the narrow design that turns the corner and goes towards the seam of the sleeve. 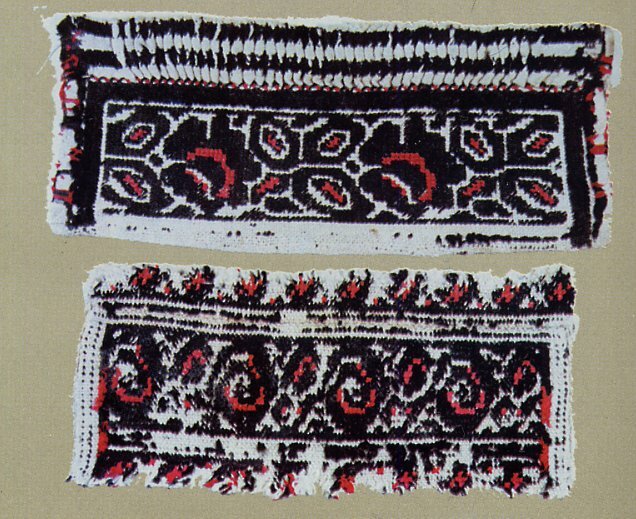 Here is an embroidered shoulder inset from a woman's chemise, showing how the embroidery is distributed on the inset itself. It also includes part of the upper sleeve, the seam being the wide black line between the two rows of the rose design. This is made by means of a joining stitch different from that of the Sokal' region. 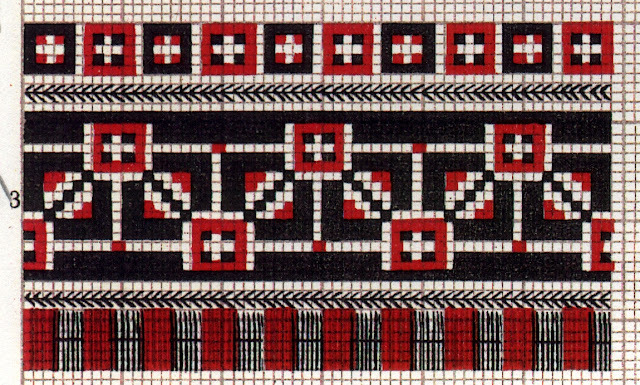 Instructions can be found in Tanya Diakiw O'Niel's book, 'Ukrainian Embroidery Techniques', on page 127, under 'Boikian Joining'. [I think the 'woman's shirt' she has illustrated is actually a man's shirt, though]. The men's shirt has almost the same cut, except that there is wide embroidery on the collar and cuffs, and just the narrow frame on the shoulder pieces. ﻿Here is a closeup of the embroidery on the collar and front of a man's shirt. ﻿The cuffs are gathered into the cuffs, and sometimes the lower sleeve is smocked over the gathers, as in this example. In some villages, the women wore a headpiece called a 'promychka' under the kerchief. The piece that showed in front on the forehead was embroidered and edged with buttonhole stitch. Here is an example of that embroidery. Often you will see design typical of this region graphed in general books on Ukrainian Embroidery referred to as Boiko. 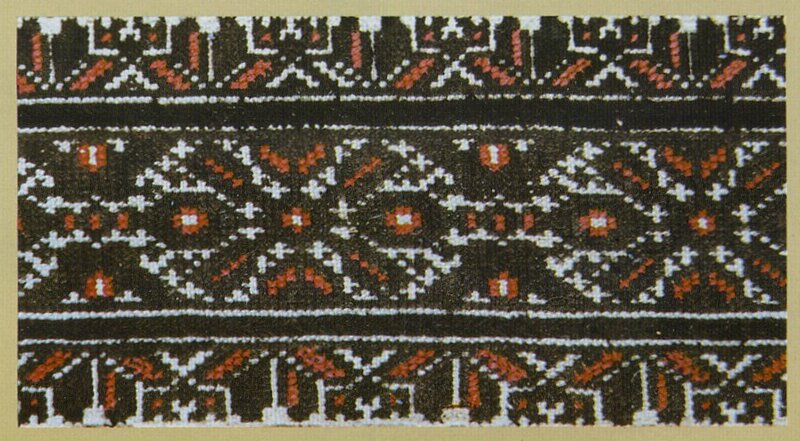 There is, in fact a great deal of variety in Boiko embroidery, in color and technique. 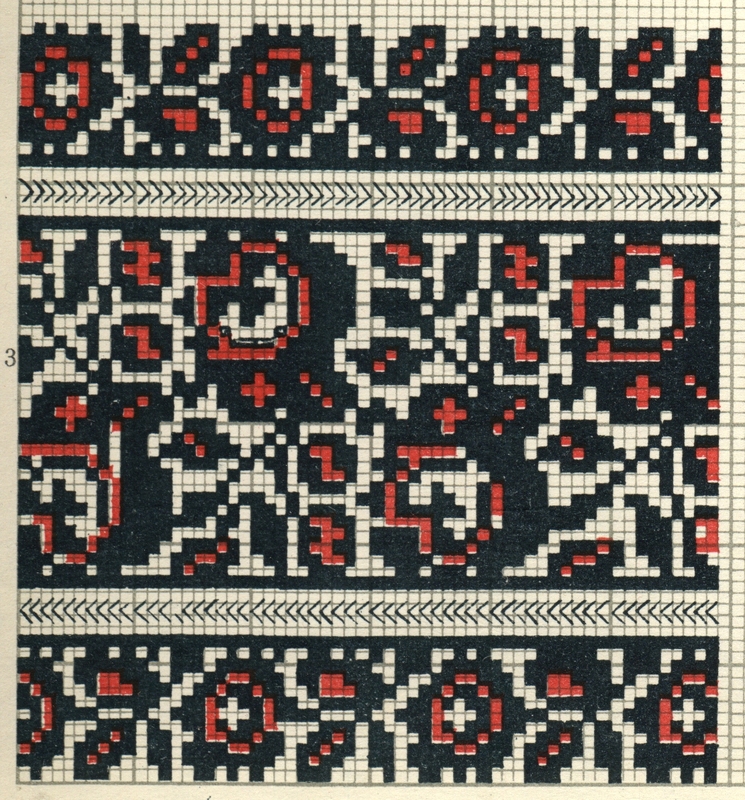 Here is one such example from Ruryk's 'Ukrainian Embroidery Designs and Stitches'. This is the design embroidered on the disjointed shoulder inset shown above. That is enough for one posting i think, so i will give you just one more embroidery design and close. Thank you for reading. I hope that you find this interesting, and will be able to use some of these ideas or designs in your own handiwork. 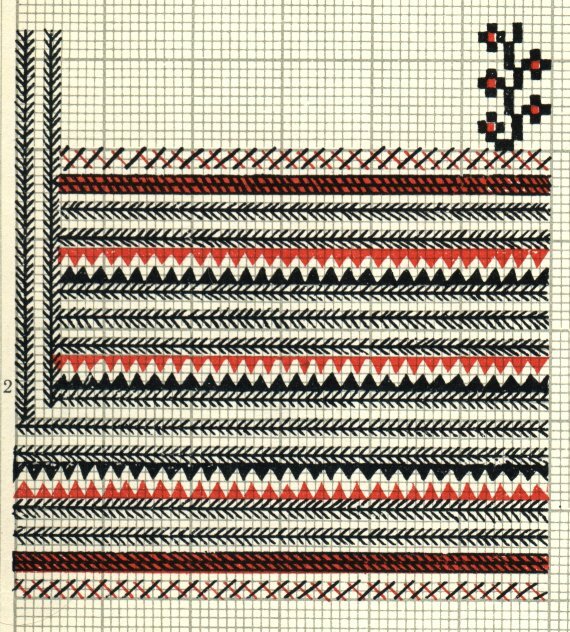 Tania Diakiw O'Neill, 'Ukrainian Embroidery Techniques', Mountaintop, Pa, 1984.